Arctic Cooling has been around since 2001, and they may be best known for their cooling solutions for personal computers. They have now branched off from their known achievements and have started offering keyboards, mice, and other peripherals, which is where this review will lead us. The Arctic M551 is one of Arctic Cooling's handful of gaming mice, and it includes specialty features intended to appeal to gamers such as high sensitivity settings and a laser engine for accurate tracking. Gaming mice are becoming quite the norm these days, and even casual gamers are almost never seen with just your basic mouse anymore. Before we take a closer look at the Arctic Cooling Arctic M551 gaming mouse, let's take a look at some of the features and specifications found on the official product page on the Arctic Cooling website. 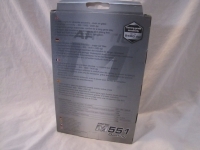 The Arctic M551 came packaged in a silver and gray retail box. 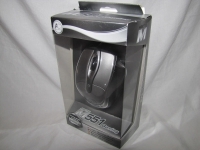 A clear plastic window helps cover the M551 gaming mouse to protect it from the elements, as well as to showcase exactly what the consumer is getting. The front of the box clearly displays the model number, as well as the Arctic Cooling logo. Other features like the highest DPI setting and gaming functionality of the mouse are also shown. The back of the box is filled with features, specifications (in many different languages), the model number, and the highest DPI setting that it can be set to, as well.